Best Seller Banner, Roller banner is ideal for promotions and marketing giveaways. High quality aluminium material. Roll-Up banner is a good choice of banner which is not only portable yet it has a professional outlook. With this professional outlook, its is not a surprise why many corporate companies has choose to use it as a common advertising tool for their events / roadshows. 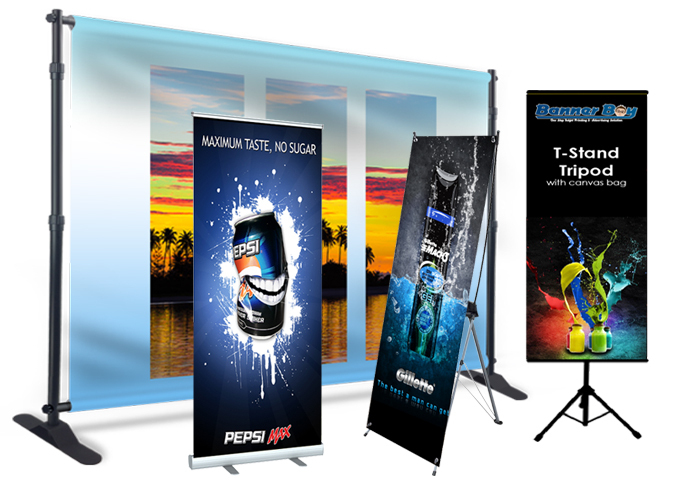 These x-Banner are retractable banners which are the easiest of all banners / standees to set up. Plus, with it being light, it can be easily transported too. Grace the backdrop of your events with our banner printing services. We provide large format printing for all your marketing and promotional demands. Our backdrop printing services are great for trade shows, conventions, product launches, and other functions. The different choices of backdrops cater to different budgets so we can work well to facilitate all your needs. No matter what the occasion, our backdrops will add to enhance the event.